We're going to keep this short and sweet today because we're back in Ohio and any time I spend in this space is taking away from quality time I could be spending with my Oma and Opa. So let's get to it: 1) Shameless self-promotion. 2) I've done the tiniest gift roundup for those of you who are still looking to buy something for the rad humans in your life. 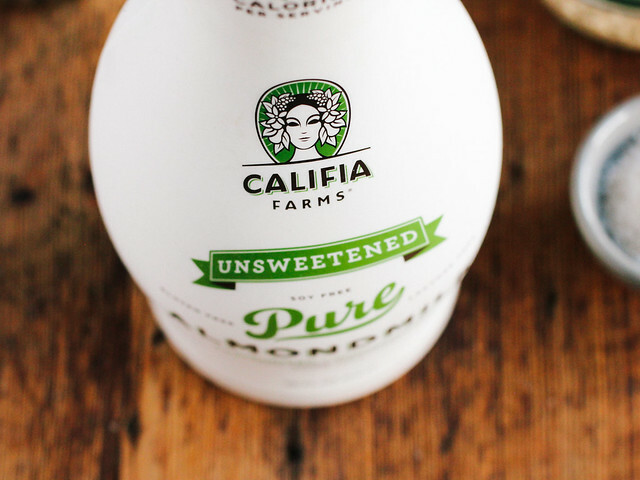 Which will pretty much only be suitable for aforementioned humans who like coffee, baking, and books that address rather controversial issues surrounding industrial agriculture/our current food system. 3) I made you truffles (with half a dozen variations). Which make a better gift than anything you'd ever be able to get from any store but, after all the work you put into making them look perfect, you're probably going to want to keep them to yourself. That's perfectly ok but you really should spread the truffle love. GUYS. Williams-Sonoma interviewed me (!) about holiday baking traditions AND they're sharing my recipe for gingerbread folk. I also just realized I never wound up posting my (perfected) recipe for coconut oil sugar cookies, so.. sorry about that. I promise I'll give it to you next year. I know Weihnachten is right around the corner but that's not going to keep me from sharing some of my favorite kitchen things: This polka dot mug, these rubber spatulas, these cake pans, and this pour-over drip pot. For those of you into non-fiction reading, the three most eye-opening and thought-provoking books I've read these past couple of months: The American Way of Eating (read it cover to cover in two and a half hours), The Soil Will Save Us, and The Unsettling of America. Oh, and just because I give it to all the horrible people in my life: the card game to end all card games. My two eldest brothers are getting it this year and I'm going to make sure all of us terrible folk play it on the day that commemorates the birth of that little boy from Nazareth. If Santa was real, I'm pretty sure we'd all be getting organic manure next year. Because if Santa was real he'd be smart enough to know that giving coal to all the naughty kids is only expediting the rate at which his precious North Pole is melting. That's all from me. I'll be back next time with that guide to Iceland and then there will be a bit of radio silence as I'm heading to Morocco and Spain (sans my favorite travel buddy) until mid-January. Happy holidays to you and yours! Notes: Rolling the truffles is a bit time consuming. You may be tempted to use a bigger cookie scoop but don't do it or else the ratio of toppings to chocolate will be all out of whack and no one wants that - so make sure you're using a 1 1/2 teaspoon cookie scoop and you'll be golden. 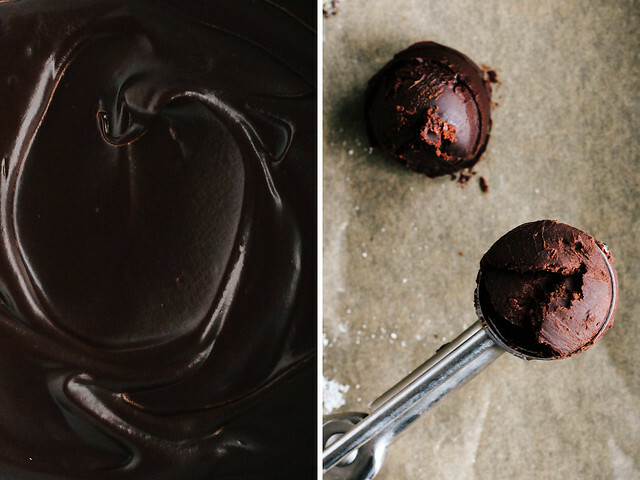 You also need to make sure you're using at least 70% dark chocolate; the darker the chocolate, the richer (and, in my opinion, the more delicious) the truffles. 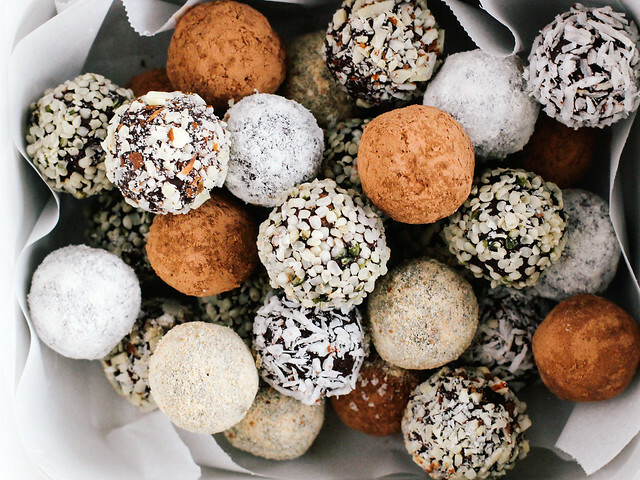 For super melt in your mouth truffles (that are also a bit messier to make) use 1/2 cup (8 tablespoons) of almondmilk. The temperature of your house will determine the consistency of your truffles. Our house was about 74˚F and they retained their shape but were perfectly melty on the inside. I moved the truffles to a cooler part of the house and they firmed up a bit, but were still smooth and delicious. First things first. Get some holiday nog and add a shot of spiced dark liquor. Turn on your favorite holiday tunes, light a few candles, and take a big drink. I mean it. In a small saucepan over medium heat, bring the almondmilk to a boil. 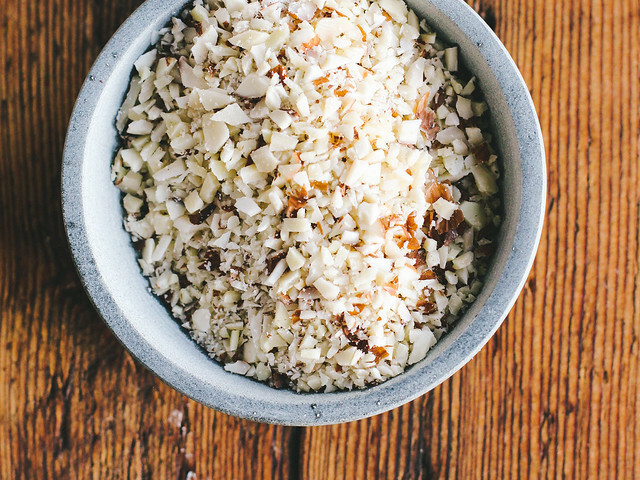 While the almondmilk is heating, add the chocolate and coconut oil to a large heat proof bowl. Put it in the oven and preheat it to 350˚F. Yes, bowl in the oven then preheat it. Once the almondmilk starts to boil, open the oven and carefully pour it over the chocolate and coconut oil. Close the oven door and set your timer for five minutes. After five minutes, carefully remove the bowl, off the oven, add the vanilla extract and sea salt, then stir the mixture until smooth and glossy. 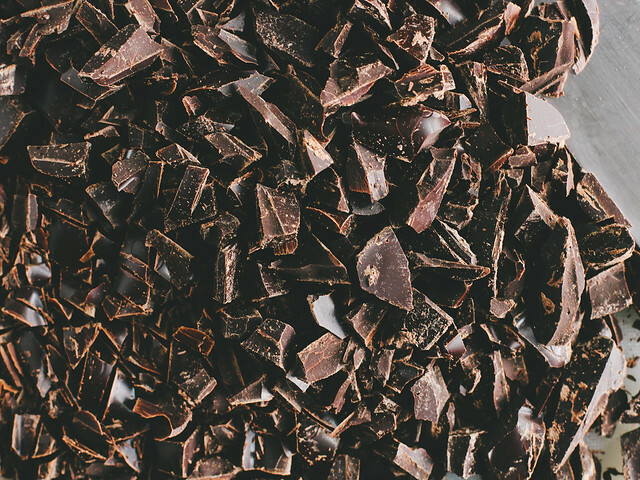 Transfer chocolate to a new bowl (you don't want to put the hot bowl in the refrigerator) then place in refrigerator to chill for at least one hour (maybe two). 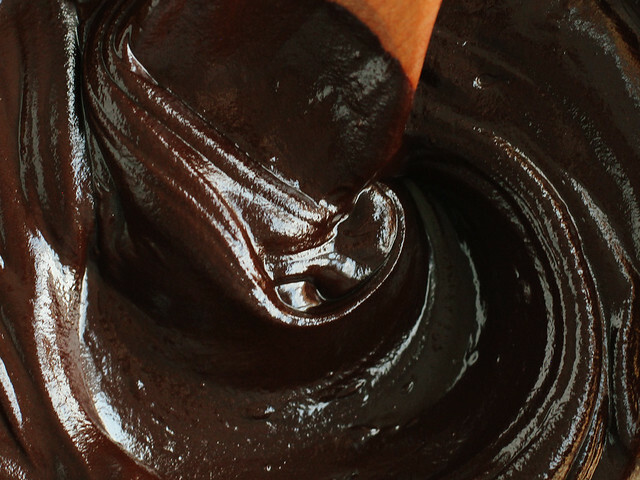 While the chocolate is firming up, prepare your desired toppings. My favorite combination was the finely chopped almonds and vanilla sea salt (self-proclaimed addict), but I also used all of the toppings listed above. Feel free to use your favorites. After an hour, test your chocolate by firmly pressing the surface of it with your finger. If your finger pokes through the chocolate, let it set a bit longer. When your finger makes a slight indent, it's ready. Line a small baking sheet with parchment paper. Using a 1 1/2 teaspoon cookie scoop, drop the chocolate onto the prepared baking sheet. Your balls may not look perfect but that's ok, we'll deal with that later. 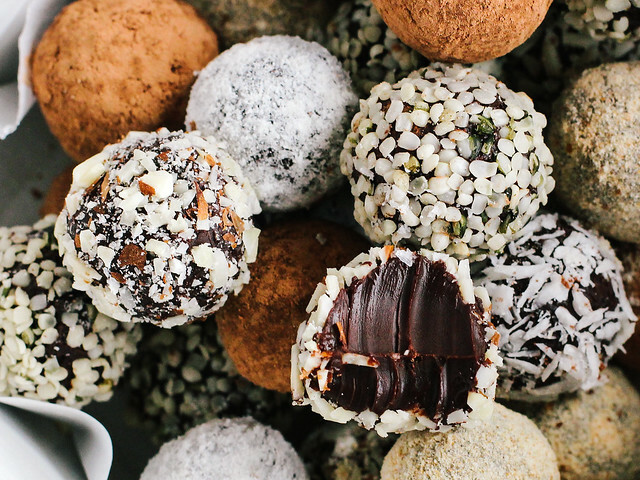 Once you've scooped all the chocolate, roll each piece between your palms until a round ball forms, then transfer the baking sheet to the fridge and let set for 20 minutes. After 20 minutes, remove the baking sheet and prepare a flat surface with all of your desired toppings. The chocolate balls will be rather hard, so you'll have to roll each one between your palms (again!) to slightly melt the surface. Roll balls in desired toppings and place back on baking sheet. 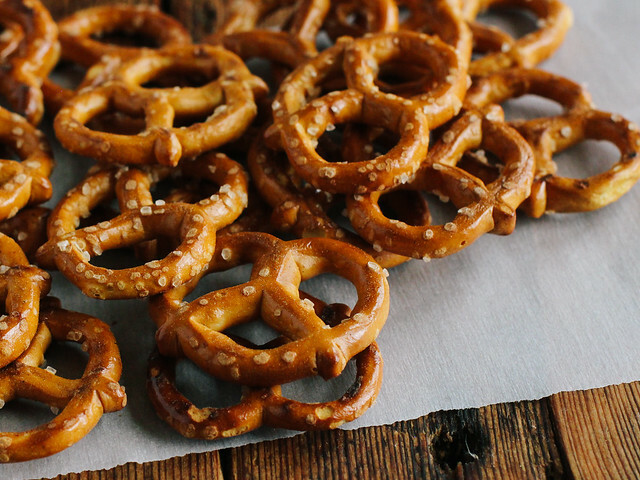 Let them sit for 30-45 minutes then transfer to a jar or container. You can store them in the refrigerator long term, but I prefer to leave them on the counter. 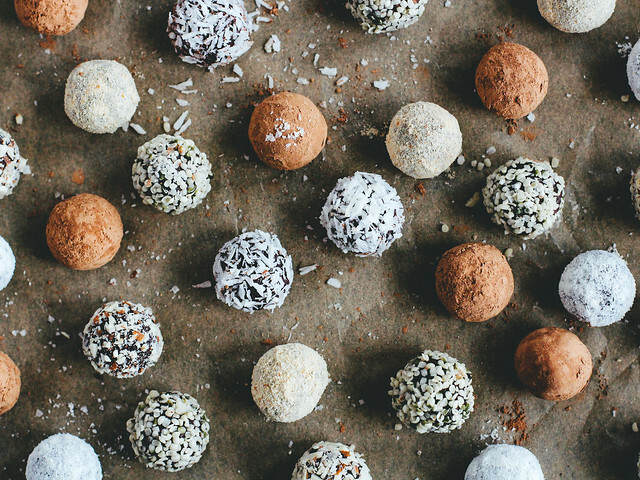 Chocolate whiskey truffles - Replace 2-3 tablespoons of the almondmilk with equal amounts of your favorite whiskey (we're big fans of the Irish variety). Roll in cacao powder. Orange chocolate truffles - Replace the vanilla extract with natural orange flavor (not orange juice). Roll in coconut flour and finely zested orange peel. 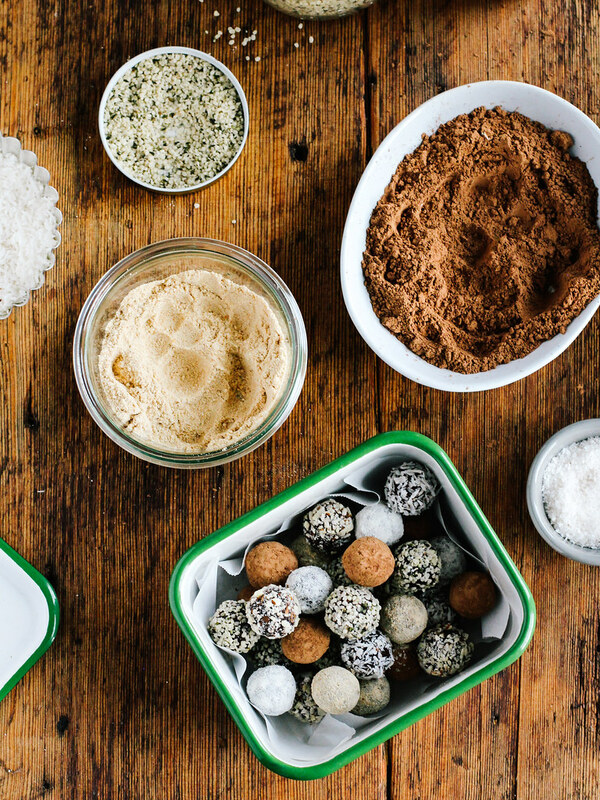 Mint chocolate truffles - Replace the vanilla extract with mint extract. Roll in cacao powder or coconut flour. 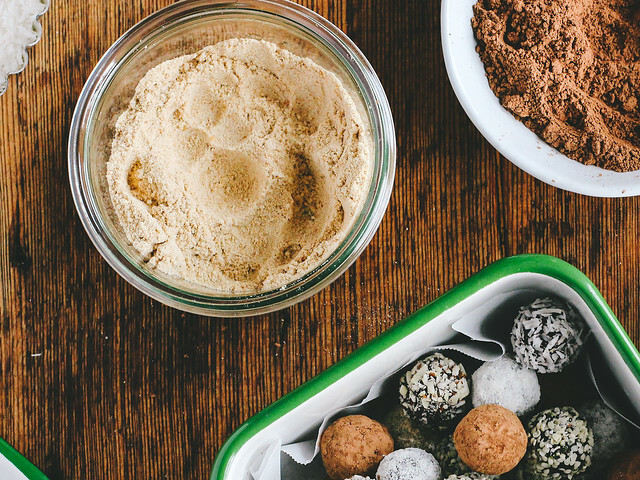 Mocha truffles - Replace 2 tablespoons of the almondmilk with equal amounts of espresso (or, for super sweet truffles, replace all of the almondmilk with Califia's double espresso iced coffee). Roll in cacao powder. 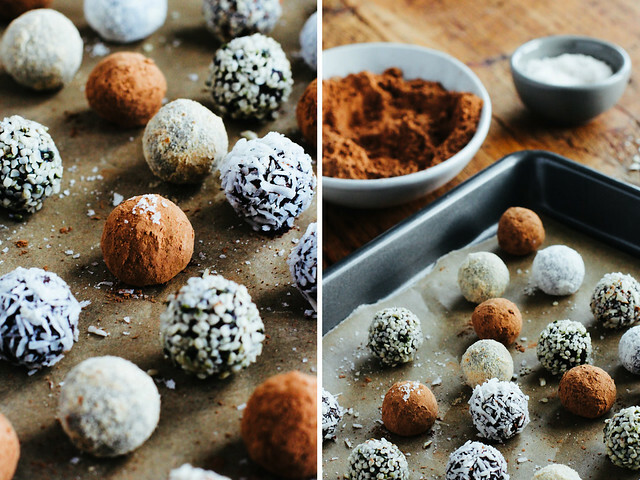 Chocolate peanut butter truffles - Replace the coconut oil with 2 tablespoons of peanut butter (or your favorite nut butter). Roll in peanut meal or finely chopped peanuts, and top with a pinch of vanilla sea salt. 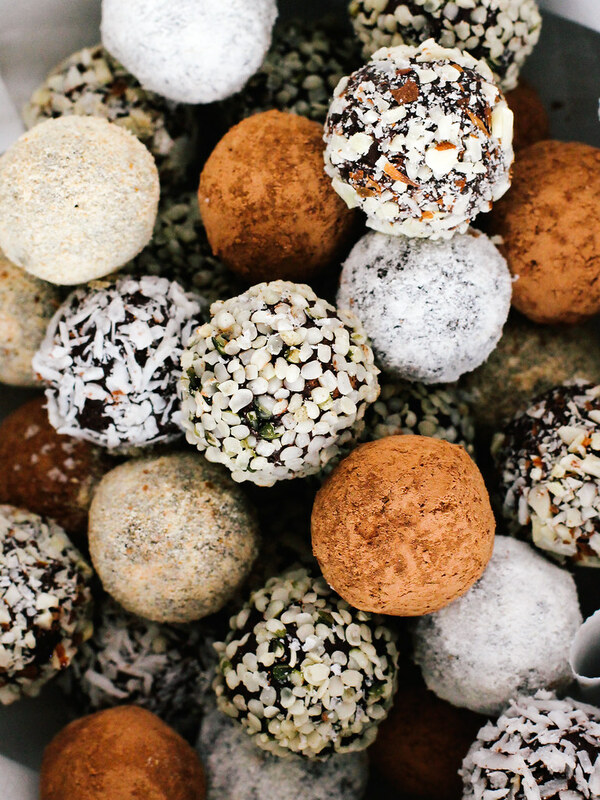 Mayan chocolate truffles - Add 1/2 teaspoon cinnamon and 1/8 teaspoon paprika to the chocolate mixture. Roll in a mixture of cacao powder and ground cinnamon.